There are two Turkish restaurants in Joburg, located close to one another in the adjacent ethnic food hubs of Fordsburg and Mayfair. I’ve written about both restaurants on jhblive.com (see here and here) but never on my blog. So I thought I’d bust out a quick post about them. If you’re craving Turkish this weekend, here’s where to go. The appropriately named Istanbul restaurant is right in the centre of the action on Fordsburg’s Central Road. Istanbul’s seating is mostly outside, but protected from wind and weather in a covered square lined with shops. 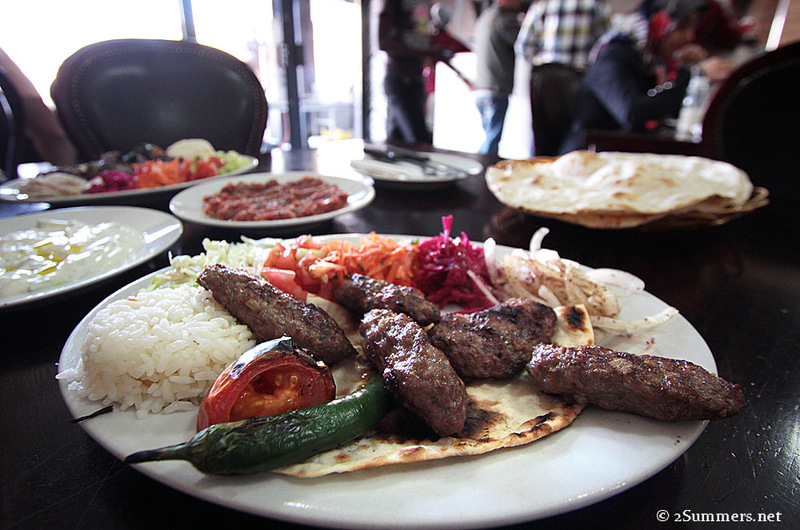 Istanbul’s menu is basic and centered around meat — kebabs, schwarma (weekends only), chops, etc. The meat is fresh, the atmosphere is festive, and the mains all cost R70 or less. Hookahs are available for those inclined to smoke flavoured tobacco. A giant platter of meat, with all the bread, sauces, salads and other trimmings. A lahmacun, kind of like a flatbread pizza without cheese. 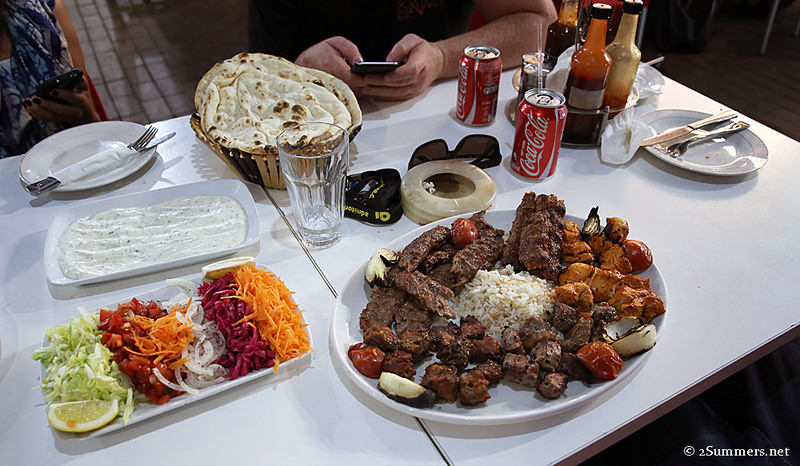 Another view of the giant Istanbul meat platter that I ordered with several friends. 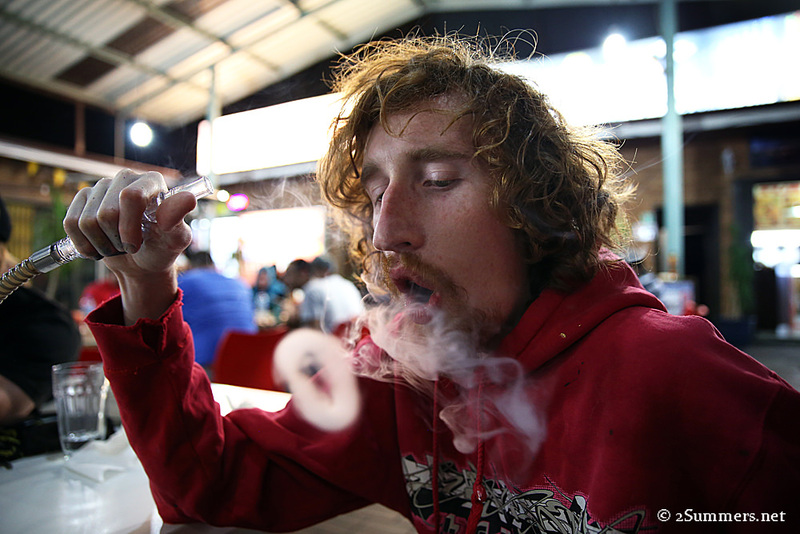 Ray blows hookah smoke rings. The guy has talent. The atmosphere is my favorite thing about Istanbul; it’s great to be out in the open air but still off the busy street. The vibe is really fun on weekend evenings. Burhan’s is also right in the thick of things, in the middle of Mayfair’s busiest street. There’s an actual butchery next door and the restaurant itself has an outdoor kitchen that is practically right on the sidewalk. 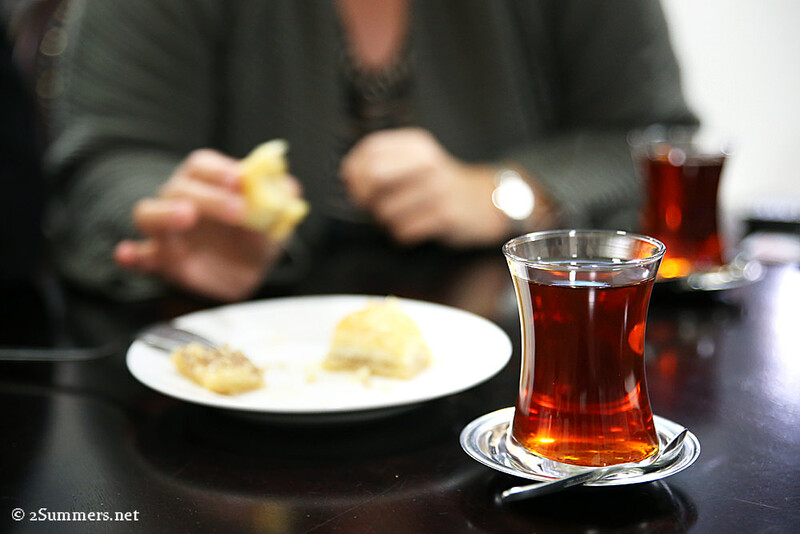 The indoor seating area is small and cozy, always filled with a diverse crowd of Turkish and non-Turkish patrons. The grilled meat is mind-blowingly tasty. 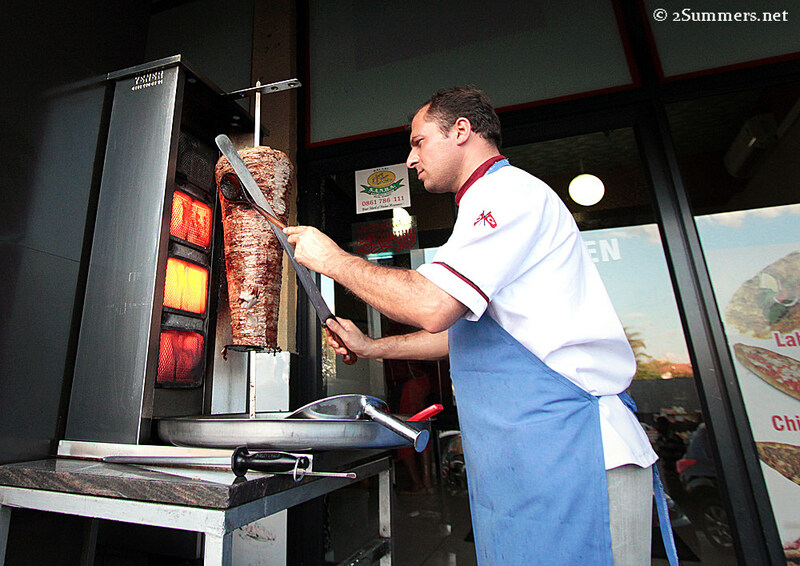 One of the butchers manning the spit outside Burhan’s. Typical Burhan’s dinner spread: Lahmacun (center), chicken chops (bottom — not sure why they are called chops but they’re soooo good), and some kind of spiced beef-lamb mince (top). I also recommend the pides — cheese-covered bread with spices and yummy toppings. 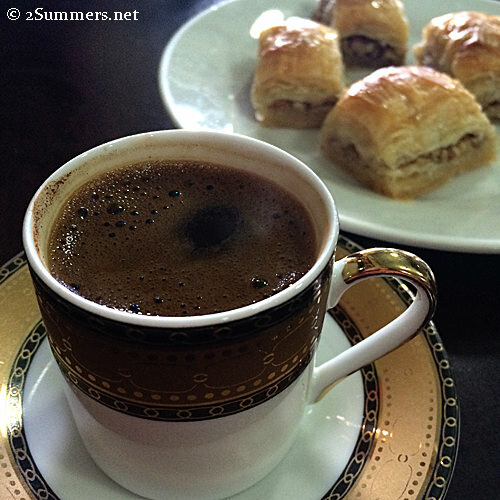 Turkish tea and baklava. I love baklava. Burhan’s doesn’t have the same ambiance that Istanbul has (no outdoor seating and no hookahs), but Burhan’s food is amazing — definitely my favorite if the two and also slightly cheaper than Istanbul. The “large” platters, which easily serve two people, are an especially good deal. There is one other great Turkish restaurant, slightly north of Joburg at the Nizamiye Mosque in Midrand. I wrote a post about the Nizamiye Mosque last year; I highly recommend visiting there. 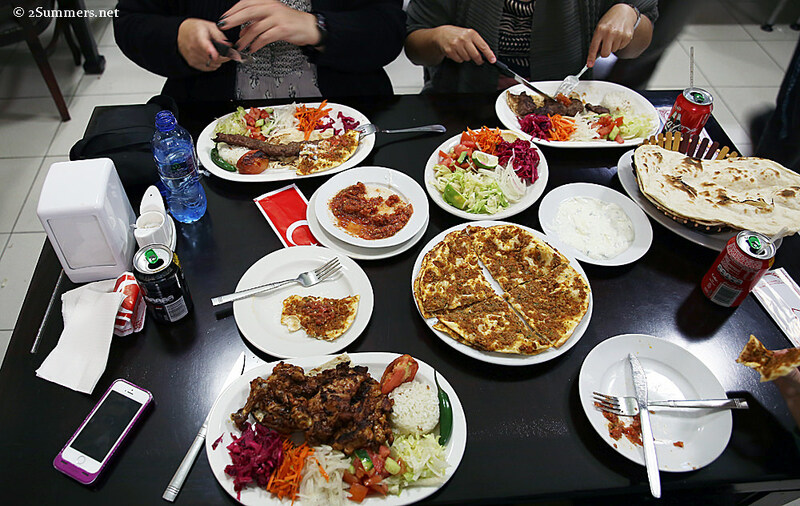 A proper visit and meal at Nizamiye will take at least two hours. 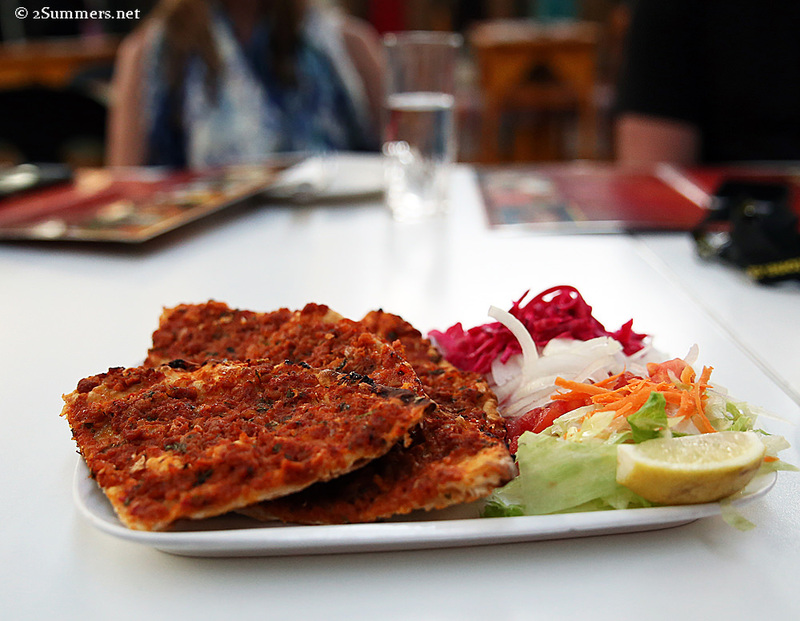 Note that Joburg’s Turkish restaurants are not for vegetarians or booze-lovers: meat-free options are slim and alcohol isn’t available. Otherwise, go with a healthy appetite and enjoy. And if you know of any other good Turkish joints, please let me know. Ooo, I’ve never been to a turkish restaurant. Will have to try these! Definitely! Such good food and so fun/affordable. Love both these restaurants and maybe you should do a blog on the one at the temple in Midrand for those that don’t want to venture into these areas. Haven’t been there for a while but did enjoy it when I did go. Burhan’s it is!! Food looks sooooo delicious Heather…can’t wait to try. Thanks for the post. We ate at Burhan’s on Sunday. It was very good! There is also a nice bakery next door. Hi Wayne, thanks so much for the comment. Glad you enjoyed Burhan’s, too. I’ve been to that bakery also — such a nice place but I couldn’t photograph it because photography isn’t allowed. No I haven’t! Thanks for the tips.